At Glen Waverley South Primary School we recognise that the environment is integral to the quality of our student’s lives. The school provides a rich and challenging curriculum that empowers each child to care for their local and global environment. We strive to develop authentic partnerships between home, school and the wider community based on open communication and shared commitment to a sustainable future. The intention is to create a vegetable garden with the purpose of reconnecting the students and the wider school community with how food is grown and where it comes from. We aim to teach students to make the best choices in the food they eat and promote a fun approach to eating healthy foods. Sustainable gardening principles will be promoted such as green waste recycling and natural fertilizer use. The garden will foster community involvement and will provide an opportunity to work closely with neighbouring Brentwood Secondary College. Glen Waverley South is a multicultural community and we would expect our garden to reflect the wonderful fusion of food and flavours from the cultures represented. Ownership of the garden is paramount and will require co-operation and collaboration between our students, the parent community, Brentwood Secondary College and staff of both schools. The project will provide opportunities to build self-esteem, social skills and school spirit and will naturally encourage teamwork and communication. GWSPS has begun a major construction/planting project featuring many sustainable assets which allow us to minimise our environmental footprint and protect the planet. The project is designed with the future in mind as we work towards completing the ‘Resource Smart AuSSI Vic’ program to become a 5 star sustainable school. 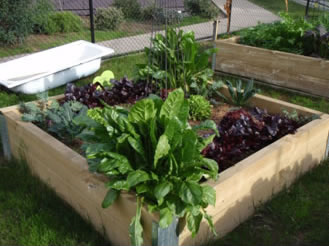 Construction/planting of a large ‘Community Garden’ to grow vegetables, herbs and fruit. Included in this area is a teaching and learning space. 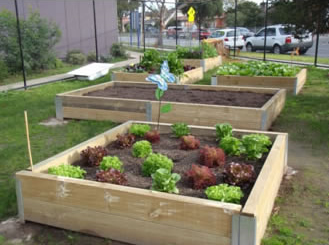 A plan to increase biodiversity within the school grounds to the east of the ‘Community Garden’ with native plantings. Included within this area will be seating/tables, curved pathways and other landscape features. The issue of ‘poor street appeal’ of this northeast corner will be addressed. Our goal is to develop an environmentally conscious culture at GWSPS and within its surrounding community. Education for sustainability is part of the teaching and learning that occurs throughout the curriculum. Students and the community can be involved in hands on learning about growing fruit, vegetables, herbs and native plants and also propagating plants, planting, composting and associated scientific concepts.